As a cat-lover, a volunteer photographer at a cat rescue, and a self-confessed cat-lady (with two cats AND a dog, is a neat-freak, has a partner and a child), I felt I just HAD to read this Kindle Single. 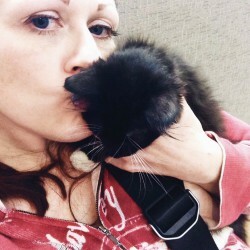 This short biographical tale follows Anna from her beginnings with her abusive father (which she convinced herself were normal), through her tumultuous and confusing years of young adulthood as a semi-functioning addict, and on to her new sober life with the two cats that went through some of the worst of it with her. I know really well that my pets have been through all kinds of ups and down with me and I could NOT have done it without them. From a personal standpoint, I kept hoping Anna would be more emotional and talk more about this, but I know that this point comes across to the reader. 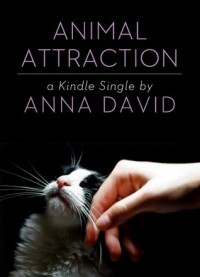 There's also a look at how the author's behavior affected the cats, and how they reflected the stressors in her life. Addiction and mental illness don't allow many people to see how their behavior affects people around them, never mind their pets. But then Anna's cats eventually act as anchors and help see her through to a place of stability and she realizes that their unconditional love and presence has meant more than she'd cared to notice before. There's a lot in this that is familiar to me, both in perspective and story, but there aren't enough pages to deal with all the topics in depth. I was just thrilled to see the personal journey that Anna went on, and that she found sobriety, self-acceptance, a little bit of 'happy', and that Toby and Lilly were there through it all.